The role of pharmacists is expanding beyond dispensing medicine and moving towards supporting patients in the management of their health and wellbeing. Studies have indicated that up to 70% of patients on regular medication are turning to pharmacists to seek for consultation and information on medicines. With this in mind, the Malaysian Pharmaceutical Society (“MPS”) and GlaxoSmithKline Consumer Healthcare Sdn Bhd (“GSK Consumer Healthcare”) launched the myPharmAssist programme in 2016.
myPharmAssist is a unique global educational programme by GSK, designed to empower pharmacy practitioners to make recommendations that can improve people’s health outcomes. Built on the foundation of science and expertise, the programme is designed and developed by pharmacists with content and training tailored for the needs of pharmacy team, specifically community pharmacists, pharmacy assistant and pharmacy owner. 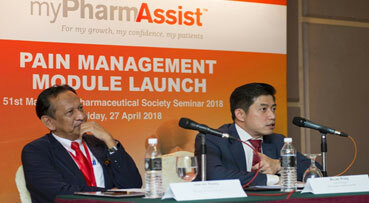 Recently, MPS led the launch of the latest module on Pain Management at the MPS’ 51st Seminar 2018, held at Hotel Istana, Kuala Lumpur. With more than four in ten Malaysians suffering from pain on a weekly basis, the Pain Management module aims to further the understanding of pharmacists on the management of acute musculoskeletal pain, headache and chronic joint pain. The Pain Management module marks the first of six modules to be launched on the myPharmAssist™ programme, which is targeted to train and empower 5,000 pharmacy practitioners by 2023. The programme provides real-life patient interactions. By doing so, it can widen the transfer of knowledge amongst pharmacists to further support their patients, driving empowerment towards a better understanding and management of pain. “Great steps are being taken towards advancing pharmacists to provide customer-centred care and meet the needs of an ever-evolving pharmacy landscape. More consumers are taking preventive care and seeking advice to better manage their everyday health. It is therefore essential that GSK supports the development of pharmacist with the right tools and materials that will enable them to empower consumers and build the pharmacy of the future,” he added. The subsequent modules of the myPharmAssist will cover topics such as cough, flu, oral and skin health, allergy, nutrition, and digestion, from the varying perspectives of the pharmacy team – from minor ailments, conditions and products to business fundamentals and understanding shopper behaviour.